Other evidence of past vclcanism is scattered over much of north California and south Oregon - patches of lava, cinder cones and extinct volcanoes are found all along the Cascade range and the wooded lands to the east. 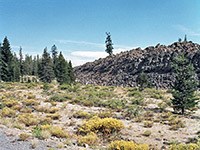 In the vicinity of Lava Beds National Monument there are several interesting locations in the Klamath and Modoc National Forests to the south, reached by gravel tracks that branch off the scenic drive, or by a rather longer journey north from CA 89. These roads are usually closed by snow until mid June so the visitor season is quite limited. One popular site is Medicine Lake. This is a small area of water, formerly a crater, with several boat launches and rather pricey primitive campsites, and which lies close to the Medicine Lake Glass Flow, a high mass of sharp lava blocks. There are no trails but it is easy enough to scramble up the slope and walk across the uneven, rather alien landscape that has deep crevasses, boulder piles and very little vegetation. Free camping is available in the surrounding national forest land. The route to the lake, the Lava Beds-Medicine Lake Road, continues south for another 7 miles to the more remote Burnt Lava Flow Wilderness Area, a much larger lava deposit surrounded by a ring of cinder cones and containing several ice caves. 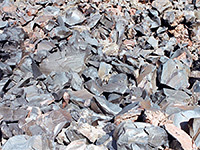 Similar scenery is found at Glass Mountain, east of Medicine Lake, where a hill of glassy lava rises several hundred feet above the surrounding pine woodland.